A last minute decision to change around parks yesterday meant that today had three small kiddie parks scheduled on it. Unfortunately, last minute rechecking of plans indicated that one of these would not be open. The offending park was right next to one which was open, but they were several hours away from our hotel by train. In other words, we were looking at spending half the day on a train for somewhere we would want to come back to in the future anyway. This didn't appeal to either of us, so we began to consider alternatives. 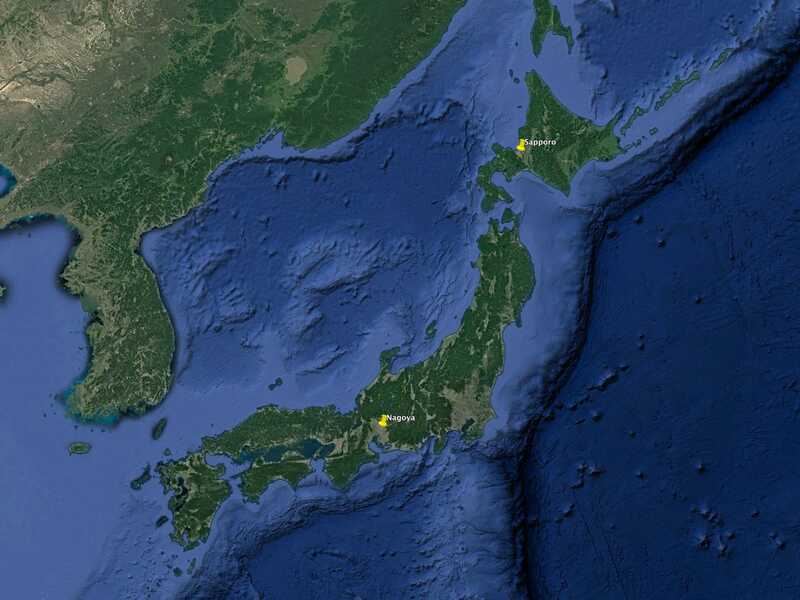 The real problem for us is that the city of Sapporo is located in Hokkaido, the northern island of Japan, and that whole area is not connected to the otherwise excellent bullet train system. The only sensible way to get there, and indeed the one we had chosen to use, was air. An overnight train journey is possible, but this is not for the faint of heart. Our flight back to Tokyo was scheduled in such a way that we were effectively stuck where we were, unless of course we chose to abandon it. These coaster trip pages have chronicled many adventures that stretch and quite often exceed the bounds of sanity. The first really stupid trip documented here was a long weekend break in South Africa. A year later, we drove a twelve hundred mile round trip (primarily) for one coaster, then did another long haul weekend trip. On this occasion, we decided to throw reason out the window and book an extra flight, with the aim of riding a certain coaster which just happens to be the longest in the world. Only in Japan can you purchase a cheap ticket on a flight that departs less than ninety minutes from the time of purchase. A few hours later we were back in Nagoya, checked into a hotel we had left a few days before. We discovered later on that our skipped flights to Tokyo were in fact fully refundable, a pleasant and unexpected bonus. Steel Dragon 2000 (#968) was for a time the tallest and fastest roller coaster in the world, and still the longest by a considerable margin. It remains the tallest and fastest coaster in the world to use a traditional lift hill rather than a launch. The lift is so big that there are actually two chains, the second starting half way up. As one might expect, it takes a very long time to get to the top of the lift hill, showing in a very practical fashion why some of the newer Intamin coasters use cable lifts. Sadly, the park does not operate their ride in the way a signature attraction such as this deserves to be operated. Just one train was in use, somewhat less than ideal when a ride from start to end takes just over four minutes. Worse, however, there is a complete absence of urgency in the procedures for loading that one train; we timed dispatches ranging from three minutes all the way through to five. In other words, the crew were dispatching somewhere around eight trains per hour, for a maximum of two hundred and eighty guests. Operational issues aside, however, the real question is whether the coaster is any good. Coming up with a straight answer for this has proved to be a bit of a puzzler, to be honest; while the ride is smooth and very, very fast, it seems to lack a certain je ne sais quoi that would catapult it from being a high speed family coaster into a true thrill ride. Other than a better view from the top it didn't seem much different to the smaller Morgans. 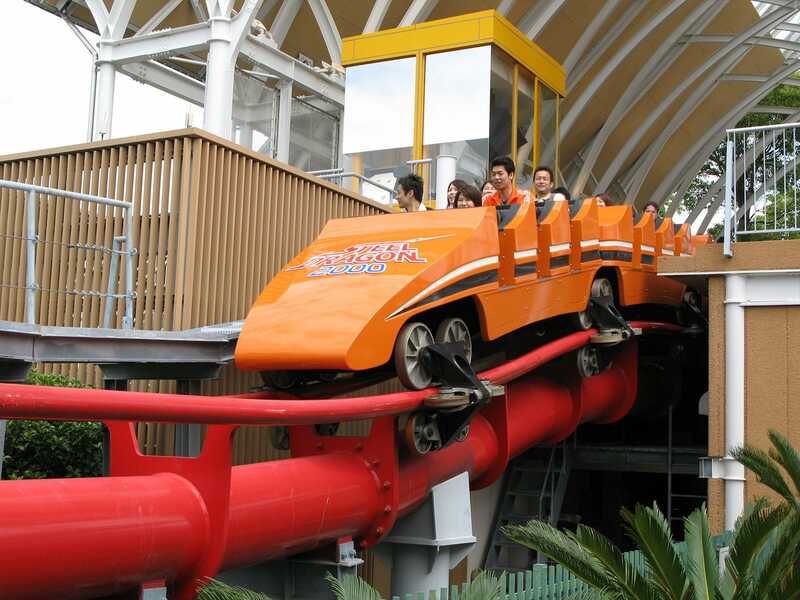 To be blunt, the engineers have managed to design a ride that completely loses the feeling of being as big as it is, not least due to relatively weak airtime. More to the point, the train design is much more enclosed than its its closest competitor, providing riders with a sense of security that doesn't exist with the Intamin rolling stock. In short, while it is certainly a fun ride, it is far from outstanding, and for us, three laps was enough. Though Nagashima Spa Land is a pretty large park, both of us had a full day to explore it on our last visit. There was certainly the option of doing so again, but we elected not to in favour of catching an earlier Shinkansen back to Tokyo. We grabbed a quick ride on the Wild Mouse (right side again, unfortunately) on the way out the door. Readers of these pages could be forgiven for thinking me an unapologetic credit whore. It's impossible to deny, given my propensity towards riding any coaster at all, no matter how small. However, there are times when reason wins out over credits, and this afternoon was one of those cases. We could easily have gone to the Toshimaen Shuttle Loop, or any one of a handful of new kiddie coasters in the Tokyo area that we had yet to ride. Instead, however, we elected to spend an evening at possibly the most beautiful park in the world, Tokyo DisneySea. We'd both been there two years ago, and couldn't wait to get back. Since our last visit the only new attraction is Tower of Terror. Sadly, it is a clone of the California version rather than the superb version in Orlando, but it does have a few minor tweaks. For a start, the architecture of the building is stunning, fitting in beautifully with the rest of the park. The other major difference is the theming; apparently the Japanese don't know what the Twilight Zone is, and thus a completely new story has been concocted for here. My non-existent Japanese was insufficient to determine exactly what was going on, though I could still appreciate the impressive special effects in the pre-show rooms. Past that, we went for an edited highlights tour of the park, taking in Aquatopia, Indiana Jones, Sindbad, and the 20000 Leagues attractions. Unfortunately the absolute star attraction, Journey to the Centre of the Earth, was closed for maintenance, but then we couldn't have everything. Finally, on the way out of the park, we caught the BraviSEAmo! show, a "tale of the spirits of fire and water". 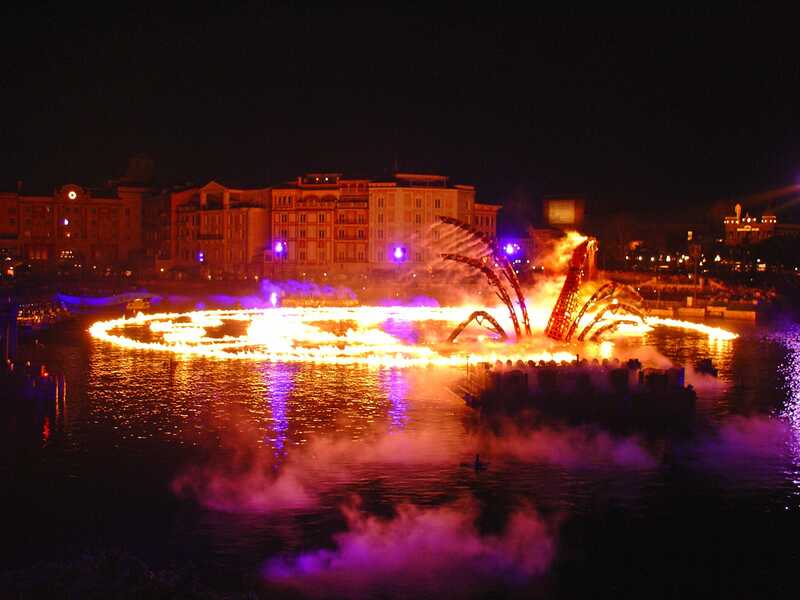 It is best described as a variation on the usual trick of fountains set to music, with some powerful lighting, fireworks, and blasts of flame into the sky. It looked fantastic, and was a wonderful way to end a ten day sojourn in Japan.